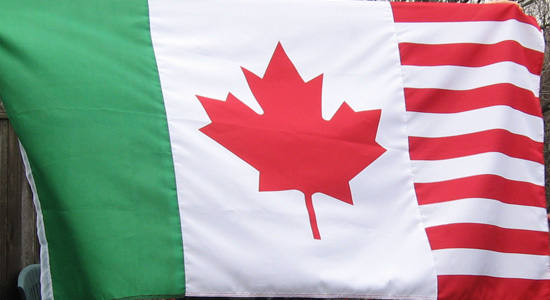 This is the only remaining photograph of a flag I made remixing the three flags from Canada, the US, and Mexico, using a sewing machine. 🙁 It was for an exhibition in Toronto that I took part in. This was right after the Hyperborder project I´d just finished, and it´s inspired in one of the scenarios that appear in the book, about how in the future, the three countries create an integrated region, think of a EU-like integration.